And I have something to report. 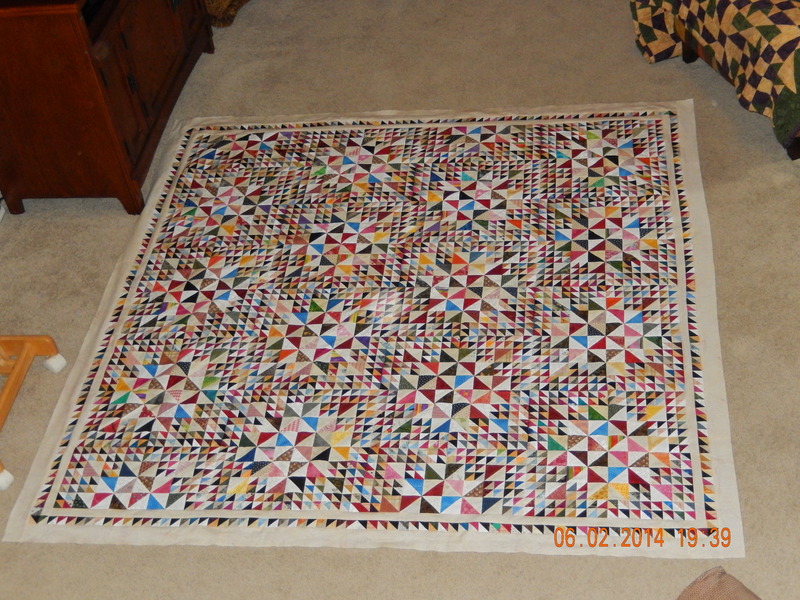 I have finished piecing a top. A long time ago I started making little bitty blocks from all the cutoffs I had leftover from making flying geese and other blocks where you cut off the leftover after sewing on a triangle. I trimmed them up into 1 1/2 and 2 1/2 inch blocks. One day a little voice in my head told me that I had enough I should do something with them. So I made the little bitty blocks. I kept making them and making them and then I added some pinwheels. 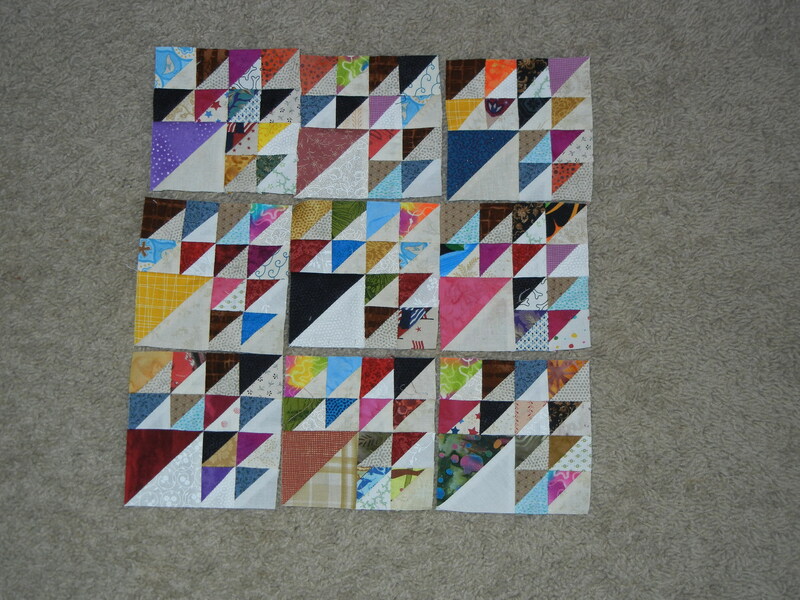 Then I made some more for a border around the bigger blocks. A week or so ago in quilt camp I had 64 bigger blocks made and then when I got home I laid them out and sewed them into rows. This takes quite some time because, as you can tell, there are a few points to try to match. People were telling me I was insane. So the working title of this quilt top became “The Voices Told Me To”. It is 72 x 72 and contains 3,016 half square triangles. So that’s 6,032 triangles in it. That’s 18,096 points. One of the points is perfect. Good luck finding it. We all say we want to use up scraps, but well, most of us don’t make scrap quilts. And if we do make scrap quilts, we march right out and buy that big extra wide fabric for the backing. Guilty! But as you know, I keep trying to do some stash reduction. For my most recent quilt, I pulled out a few blocks I had already made (see my gadget challenge) and another one that I made in complimentary colors for the quilt. I did have one piece that was 2 yards that was in my stash. The rest is just smaller pieces from my stash. Please don’t think I invented this method of taking a block or two and putting it in a strip of fabric so that it makes a “panel”. I’ve done my own version of it for a while, but I usually only use cutoffs from the front or leftover pieces. And note, I am not trying to center anything. The lighter blue on either side of my panels is actually a two yard strip. I started with it, made and added the red panel. Then I had a small piece of the same light blue (oriented the other direction–it’s a directional fabric) that I added to the red panel. 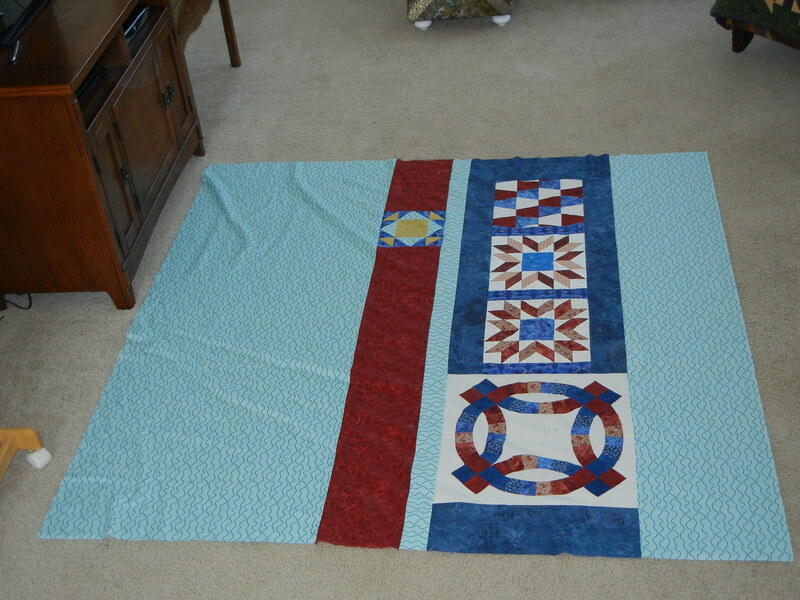 Then I used up several blocks and made the darker blue panel and sewed it to the right of the narrow blue strip. Then I sewed the light blue fabric (2 yard piece) to that panel and made a tube. At that point, I had 4 panels joined in a tube. To finish the backing, I randomly selected a spot to tear the fabric so that it looks like I have 5 panels. And neither of my block panels are centered either horizontally or vertically. That’s too much pressure. Honestly, I could have made a couple of more panels and maximized scrap usage. But that’s enough for today. How about you? Do you ever make scrap backings to use up your orphan blocks? I only used 5 on this backing, but I have used more. And used those big purchased solid backs too. One thing my sewing room doesn’t have is a door. We are going to remedy that next week, so I had to move a bunch of stuff out of my sewing room. This is my guest room that has a twin size bed. On it you can see four tubs. That is my entire stash. All of it, every bit, except a small bin of strings. Anyway, I figure it is still hundreds of yards of fabric (and I hope my husband never sees this post). Way more than I will ever need, and yet not nearly as much as many of my friends have. How about you? Could you fit your entire stash into 4 bins on a twin size bed and have room left over? This really hasn’t been a great weekend. 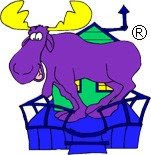 My husband worked yesterday and again today–some big computer project they are working on. 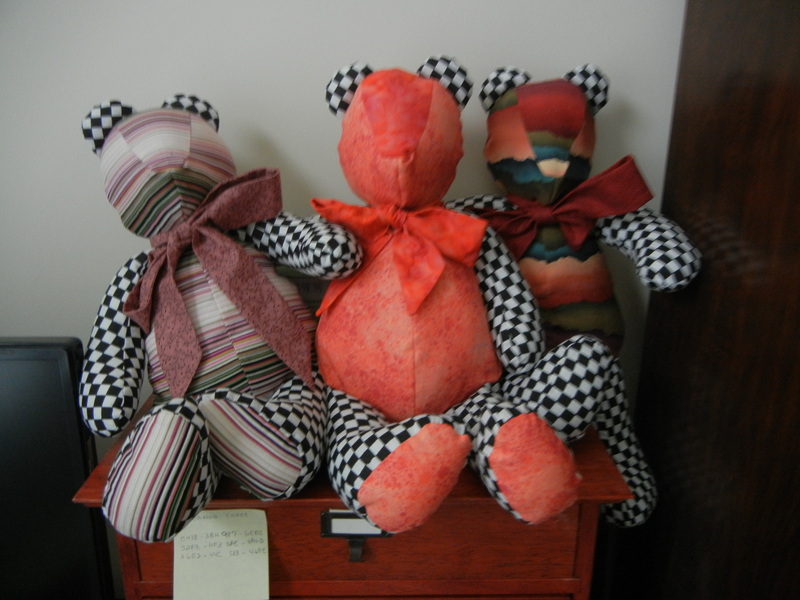 Yesterday while he was at work, I made a few of the Victory Junction bears. Yes, you’ve seen bears from me before…they apparently are breeding under my supervision. Today I decided to make some more of those scrappy blocks. I had only made 30, and people urged me to make a bigger quilt from them. So here I go . I now have all the pieces cut out to make 34 more blocks. So I can have 8 x 8 rows (or 72 x 72) before sashing and/or borders. I’m thinking I should make the entire top–and back if I can–from my stash. That’s roughly about 14 yards from stash, which would make a really good start to this year. 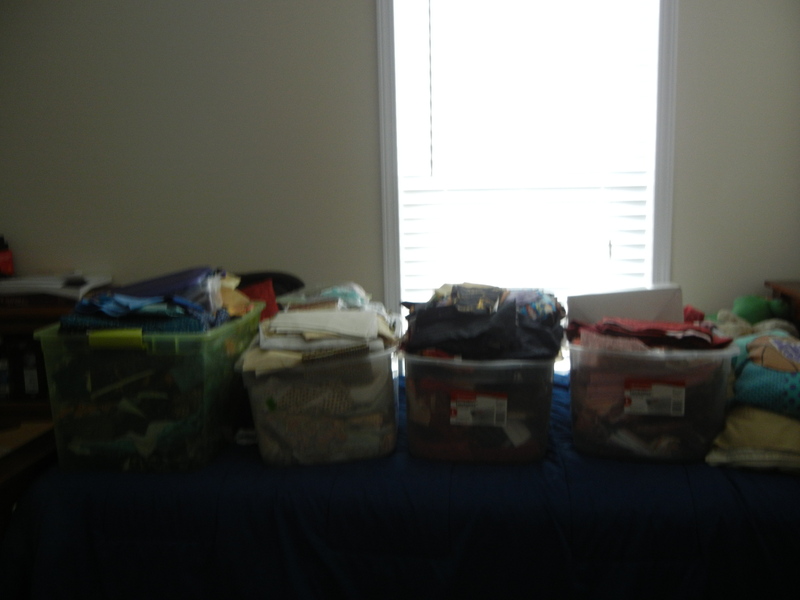 I also have several tops up in my sewing room that need quilting. I really need to get on that, but I am feeling so uninspired lately. 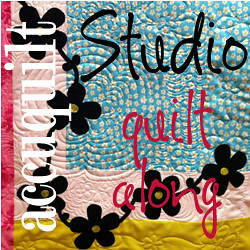 I am uninspired, out of practice, and I find it so hard to do anything and be happy with it when I see everyone else’s computerized quilting. Mine seems…..lackluster. I know, the answer is to computerize the longarm, but I don’t have the money for a hobby, and I don’t have the time for a business. And so, I am stuck. But in the meantime, I do have the inspiration to make some blocks, so I will continue with them. Hope your Super Sew Sunday is going well, too! I’ve always like Lemoyne stars, but I never liked having to cut the diamonds to make them. So when I found a template to make them, the Rapid Fire Lemoyne Star Template, I had to buy it. Of course, my obsessions with gadgets and rulers helped me decide, too. I found it pretty easy to use, and set out to make one of every size. I didn’t quite get there. I made them in the following sizes: 12, 11, 10, 9, 8, 7 and 6 inch sizes. Then I put them together in a top with a “scattered” look. 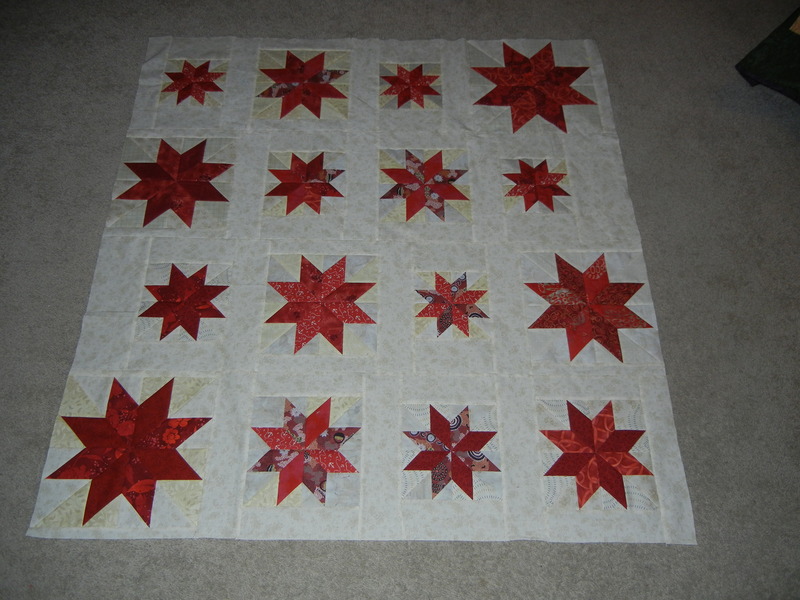 I am considering adding a border of small half star points–kind of like a crown all around. I used a variety of reds and backgrounds for the project, making no two stars alike. I liked the accuracy of the ruler and even used the fussy cut end–not to fussy cut, but instead, to use up scraps! Tell me what you think! Well, my foster puppy got adopted. My dog was a little worse the wear for the puppy’s visit. She had a growth on her neck that I had actually been talking with the vet about removing. The puppy nicked it, and it would not heal up, so full speed ahead on the removal. And due to the location of it, she had to be put under. So for the last week, I have actually located my sewing room again. Yes, there it is, right where I left it. In my sewing room, I had left a bunch of half square triangles. I have been sewing them up into these blocks. Which measure 4.5 inches unfinished (4 inches finished). Right now, I have approximately 130 blocks. At their size, not really enough to do much with! Maybe if I do a medallion. But what’s in the center of that medallion? I don’t know. I must be totally insane. And of course, since these were already made and set aside, they do not count toward stash usage at all. And you may have been noticing I forgot my stash report at the beginning of this month. Yes, that was the puppy thing. Anyway, now that I have actually FOUND my sewing room, maybe you can look forward to some more interesting posts! What are you working on? For years I have made various patterns that require that you lop off the back sides of triangles. I have faithfully stitched a half an inch from the front seam and lopped off half square triangles to trim up and use again. Well, the other night the presidential debate was on, and it seemed like a good time to start trimming. And then the next night I trimmed some more. I currently have over 1100 half square triangles. And there are more to trim! Two different sizes — 1.5 inches (finished 1 inch) and 2.5 inches (finished 2 inches). There are a lot more of the smaller triangles. Does this count as a UFO? I think not, until I start putting them together and then leave them set again. I am happily taking suggestions on what you would do with these HST.